Hindu God Ganesha Statue is the Lord of success and destroyer of evils and obstacles. 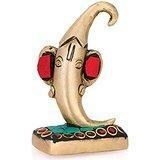 Pagdi Ganesha Statue is known to Bring prosperity and happiness in your home & Office. He is also worshipped as the god of education, knowledge, wisdom and wealth.Ganesh Sculpture can certainly be used for good Fengshui. In fact, feng shui being the art of creating harmonious, healthy and prosperous environments, is open to using any symbols, images and ideas that work for the home owner. Size : 3.2 Inches Height X 2 Inches wide X 1.2 Inches depth. Weight : 200 Grams ,Material : Brass, With Turquoise and other coral stone Handwork. -----------------------------------------------------------Pls beware from Copy product & ensure buying authentic product. This is exclusive inhouse design & product of Brand "Collectible India" and "covered by intellectual property rights laws". 'Collectible India' doesn t authorize any other Brand/Seller to sell it and we won't be responsible if any counterfeit or substandard product send by any other seller.